Sheffield Eagles loose forward Pat Walker says he is ‘gutted’ to be leaving the club at the end of the season. Walker is one of 10 players who will not be joining the full-time ranks for the 2016 campaign after the list was announced on Monday. Walker’s three-year stint in South Yorkshire will come to an end after the Super 8s, and he admits that he is devastated to be leaving the club, where he says he wanted to remain for the rest of his career. “I am gutted to be leaving,” Walker told The Star. “I didn’t really want to leave, and would have been happy to stay here until the end of my career, but unfortunately it has not worked out that way. “The club is moving on in a different direction and it is unfortunate that I won’t be part of it. Walker, nicknamed Patch, joined the Eagles in 2012 after spending six years with Dewsbury Rams, and played in the 2013 Grand Final success over Batley Bulldogs. This season he has made 16 appearances in all competitions, which included a man-of-the-match display last time out against Halifax at The Keepmoat Stadium. 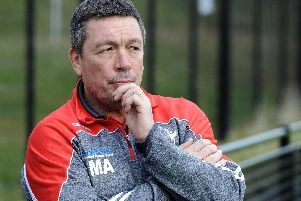 He admits the three years spent in the Eagles’ dressing room are unrivalled by any other period during his career, and is sad about the break-up of one of the most successful chapters in the club’s history. “I have really enjoyed my time at Sheffield,” added the 30-year-old. “I don’t think I have ever experienced a team ethos like this one at any other club. I have played with some great lads and made some really good friends while I’ve been here. “I know the lads who are staying are gutted about the amount of players who are leaving. Walker was instrumental as the Eagles recorded their first points of the Super 8s with the victory over Halifax. They are back in action this Sunday at Leigh following the Challenge Cup Final break.